Just minutes after she returned to Rwanda after 16 years in exile in January, opposition leader Victoire Ingabire drove to the memorial honoring the victims of the country's 1994 genocide and delivered a speech calling for reconciliation between Tutsi and Hutu. Yes, she said, Rwanda must honor the Tutsi who were the main target of the genocide. It also must remember the Hutu who were victims of crimes against humanity at the same time. To a Westerner's ear, the words of Ingabire, who has announced that she will run against President Paul Kagame in elections this August, may have seemed like standard political boilerplate for an aspiring politician. But Ingabire, a former accountant, has now been charged in court for those remarks. The government says she violated a genocide-ideology law that is meant to keep people from downplaying or denying the slaughter. Indeed, Martin Ngoga, the prosecutor in her case, says the speech was essentially a coded message meant to appeal to ethnic Hutu and diminish the genocide. 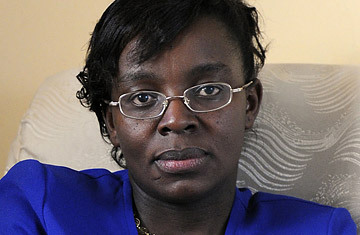 Ngoga says the government has amassed enough evidence to prove that she collaborated with Rwandan rebels bent on overthrowing Kagame. Determining whom to believe depends on whether you trust the government's narrative about Rwanda today. Is Kagame's ruling Rwandan Patriotic Front (RPF) the righteous steward of an increasingly prosperous but fragile country, willing to make the tough decisions so that it doesn't backslide into violence once again? Or is the government, as critics claim, using the threat of genocide to quash opponents like Ingabire who say the RPF must be held accountable for its alleged crimes during the genocide? "This is where the issue of context comes into play," Ngoga says in an interview with TIME. "The statement that, 'Yes, there was a genocide, but there were some other people also killed,' made on top of the graves of victims of the genocide, a few minutes, 10 minutes from the time of her arrival in the country  is it the same as the visit by many other people who come to Rwanda and go straight to the memorial with flowers to pay homage to the victims of the genocide? Are you saying she had gone there really, contextually, to do that?" "The issue is the philosophy behind it," he says. "It's not one of criminality, it's one of philosophy. The insistence is not based on the concern that this is a group that will be forgotten. No, it is based on an attempt to play down the bigger project of the genocide." Ingabire insists that her message was one of reconciliation, and that the only way to achieve it is to talk about what happened honestly. "When I went to the memorial, what I said was we condemn the genocide against the Tutsis and we ask that all the people who were involved in the killing of the Tutsis have to be judged," she told TIME. "But I said the way to reconciliation is far off because there were also other crimes in Rwanda committed against Hutus. The Rwandan government does not accept that. If you say I condemn the genocide against Tutsis, but at the same time I condemn crimes against humanity against Hutus, they don't accept that. They say we have to talk  but only about genocide and not other crimes committed in Rwanda." Ingabire and many rights activists inside Rwanda and beyond believe this is part of a wider crackdown ahead of the election. Ingabire, who was little known in Rwanda before she returned, can't register her FDU-Inkingi Party. Neither has another opposition group, the Democratic Green Party of Rwanda, been able to register. "We have documented a number of incidents of intimidation and harassment of opposition groups in Rwanda in recent months," Erwin van der Borght, Africa program director at Amnesty International, said in a statement last week. "Now with the arrest of a potential presidential candidate a few months ahead of the election, we call on the government to demonstrate that this is not another such case." Ngoga compared the genocide-ideology law to European laws against denying the Holocaust. Those laws, however, almost entirely limit themselves to people who deny outright that the Holocaust occurred, or in Austria's case, for example, anyone who "grossly plays down, approves or tries to excuse" Nazi crimes. Rwanda's law defines the crime in part as "marginalizing, laughing at one's misfortune, defaming, mocking, boasting, despising, degrading, creating confusion aiming at negating the genocide which occurred, stirring up ill feelings, taking revenge, altering testimony or evidence for the genocide which occurred." While rights activists say the government uses the law to stifle dissent, Ngoga says the law is an important bulwark to protect against ethnic divisions. "There are people who, given the opportunity, would do it again," he says. "There are politicians who would like it to happen. There are armed groups that want it to happen. There is a population that we continue to educate but is not educated enough to the extent that they will not be manipulated again." Ngoga tells TIME that the government has finished about 80% of its investigation into Ingabire and has plenty of evidence to back up its other charge, that she collaborated with a terrorist group. That would be the Democratic Forces for the Liberation of Rwanda, known by its French acronym FDLR, which was born out of the genocide and is made up largely of Hutu, some of whom took part in the killings. Ngoga says the government has records that Ingabire sent money via Western Union to the group and met with its leaders in Kinshasa, the capital of the Democratic Republic of Congo, where the group has its base. "The issue of how much evidence we have and how credible we are  I would assure you, the evidence is enough. But of course this is a matter for the court to adjudicate." Ingabire denies that she ever sent money to the FDLR and says she visited Kinshasa to raise Congolese government support for her party, not to meet with rebel leaders. "I want really to see what kind of evidence they have," she says. "I did not send money to FDLR. We asked them to show the evidence, but they did not do it. Maybe when they go to the court, they will show that evidence."